Latest Arsenal news. Arsenal veteran attacker Tomas Rosicky will be playing his final day at the Emirates Stadium tomorrow, as per the reports. Arsenal veteran attacker Tomas Rosicky will be playing his final match at the Emirates Stadium tomorrow, as per the reports. The 35-year-old has trained for the final time with the Gunners squad earlier today and will be featuring for the last time tomorrow in a Premier League game against Aston Villa. Also Read: Jordan Lukaku hints Arsenal move! Rosicky joined the Gunners in 2006 from German side Borussia Dortmund, however due to his injuries he failed to reach the highest level. In his ten years of stay, he has made 246 appearances scoring 28 times in all campaigns. 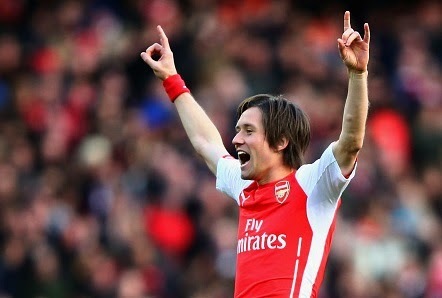 Arsenal midfielder Jack Wilshere has paid tribute to Rosicky who has been with him since his promotion to first team. The Englishman was promoted to first team in 2008 when Rosicky was a regular player for the Gunners. Meanwhile, Wilshere who has not started a game since his return from injury and expected to play tomorrow’s game, alongside Rosicky. The club and the fans will miss Rosicky for his ten years of service both on and off the field. We wish the best of luck to the attacker for the future.